Hello again. Sorry it’s been a while, but I’ve been busy prepping a new adventure that’s going to be huge — literally! It’s my first time tackling a full-size published campaign, and I chose Storm King’s Thunder, where my players are going to take on giants. Wish me luck, and happy gaming!!! 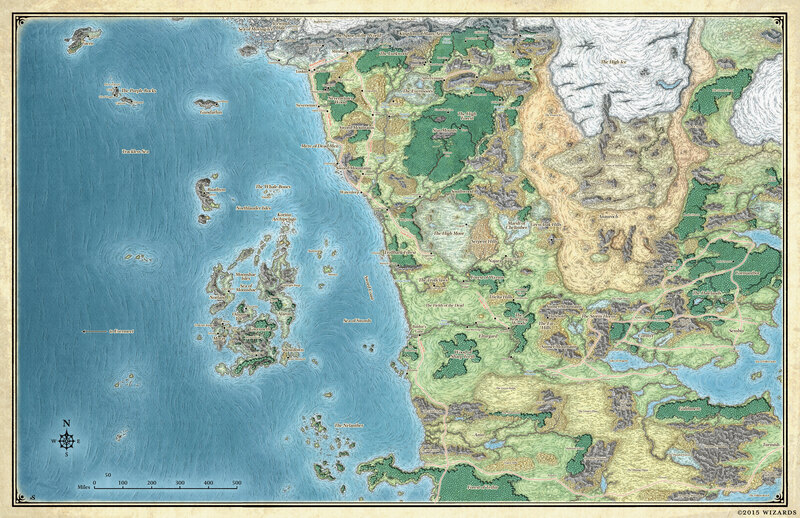 NOTE: I used Vivyx Printers (Signs and Banners, Vinyl Banner, 31″ x 48″) and used this hi-res map from Mike Schley ($5), which has locations from Storm King’s Thunder. You might also prefer this map from Wizards of the Coast. When I ran Storm Kings Thunder I did a similar thing. I also printed out the map onto a couple of sheets of A4 (Letter in the US I’d imagine) and taped them together. Aged it a little and handed it to the players as their “in character” map that they could make notes and annotations on. I didn’t realise at the time that it gave away a few locations but, thankfully, my players didn’t metagame so it was all good. Thanks for the comment! I’m going to surprise my players with the big map, and hopefully they won’t meta-game too much, either! I like your idea for a “sequel” to the campaign with the storm king’s return. Thanks for reading!